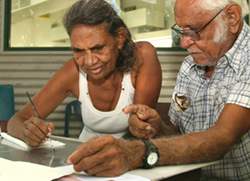 Kununurra husband and wife team Alan and Peggy Griffiths are the first artists to take advantage of Charles Darwin University’s Northern Editions print workshop sessions for the year. Workshops are a regular part of the calendar for Northern Editions. Each year it plays host to artists from the Northern Territory and other parts of Australia who want to learn more about the art of printmaking by spending weekly sessions in the printmaking studio. For Alan and Peggy Griffiths the week-long visit to the Northern Edition’s studio is a chance to learn new skills and improve on techniques that they have learnt through previous sessions on the Casuarina campus of Charles Darwin University. The couple have lived in Kununurra since 1964, and are established artists in the East Kimberley, with exhibitions in major galleries. Their visit to Northern Editions this year was made possible by a fellowship to Alan Griffiths from ArtsWA under its creative development scheme. Last year Alan Griffiths’ paintings and prints were shown by Northern Editions as part of this same fellowship. The couple says they are enjoying experimenting with various colours and techniques of printmaking on this visit. Over the past week they have been creating a series of etchings using ochre colours – with their images inspired by their own country. Alan Griffiths originally came from Timber Creek in the Northern Territory, while his wife Peggy comes from Keep River. They both began painting in the early 80s and are leading artists of Kununurra’s Waringarri artistic community. Prints by Alan and Peggy from this workshop will be included in a planned boxed suite of prints from Waringarri Artists, whose many other artists will undertake printmaking workshops over the year – either in Darwin or at Waringarri art centre. The boxed suite will be printed by Northern Editions and exhibited next year. 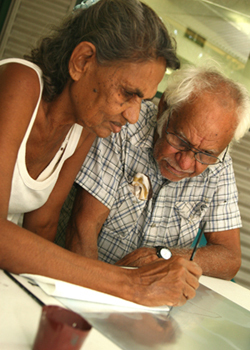 As an elder of his community, Alan Griffiths is also busy preparing a book on the cultural life and country of his people.